» Forum » Tech » Tech: Modern games » Data East Star Wars - Boards replaced, now what??? » Data East Star Wars - Boards replaced, now what??? Data East Star Wars - Boards replaced, now what??? Hi all - you might remember my post from about a year ago about my (cursed) Data East Star Wars; I'll save you the rambling version of the story, but the long and short of it is that it would take forever to boot up, *maybe* play correctly for a single round (if it fired the ball in the trough at all), and would light up. 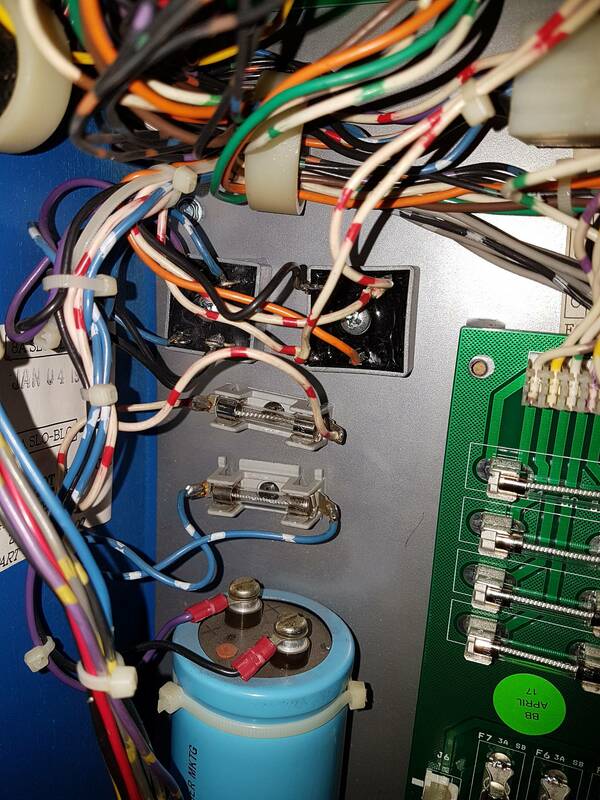 I had a tech in four times to try to address the issues (he replaced a few fuse clips on the flipper board and the PPB, but couldn't really tell me what the issue was/find any solution). So I bit the bullet and saved up for replacement boards. Now, the game will boot up immediately (as opposed to anywhere from 5-15 minutes), Obi-Wan says "May the Force be with You", the GI illuminates - and then shuts off, with nothing other than a few blips on the DMD for a split-second, then nothing. There seems to be a humming/buzzing coming from the speakers, but nothing else (Obi-Wan is clear as day, so I'm not sure what's doing there...). I was able to get a few pictures as the table booted - in the first, on the MPU004, the PIA light and the +5V light illuminate, then (in the 2nd pic) the PIA light turns off while the +5V remains. Immediately after, the Blank light illuminates (3rd pic), and the GI shuts off completely. I also have the +50VDC light on the PPB001 illuminate. I've checked and rechecked all of the connections, everything is where it is supposed to be and firmly clipped in. 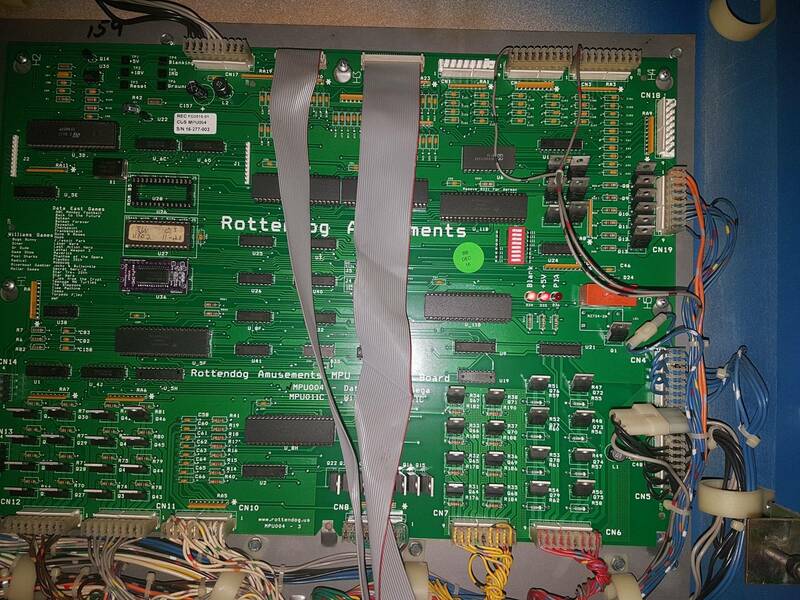 None of the fuses on any of the boards are blown, and I moved the two chips from the DE MPU to the Rottendog MPU004 (C5 Star Wars ROM, and the D3, both of which are in the same position they were on the original DE board). Any thoughts/ideas/prayers/HELP would be immensely appreciated!! Thanks!! I would check the power board test points to ensure I had the right voltages. The CN3? square plug on the main power board is notorious for getting burned up and if you are missing voltages the game won't boot. The sound card firing only needs 12v, so thats fine, but the game needs many voltages as you know. Unplug that big connector and check the pins. I wouldn't worry about the hiss/static from the speakers (this is common and something you can look at last). dose the game play, just no display? The CN3? square plug on the main power board is notorious for getting burned up and if you are missing voltages the game won't boot. Can you measure the voltages on the power supply and report them? This suggests it is a MPU issue. Do you have the anyPinDMD+ NVRAM set to 6264? I cannot tell since the picture is blurry as I zoom in on it. Why did you swap out the original MPU? I would try the original MPU. I had no idea I had to do anything with the anyPinDMD+ NVRAM - the instructions from Rottendog only mentioned the C5 and the D3 from the original MPU. I will check what the anyPinDMD+ NVRAM is set to (again, once I get home from work) - thanks for the heads up! I would put the original ram back in that spot. It doesn't sound like you need the anypindmd nvram with the rottendog board. Thanks! 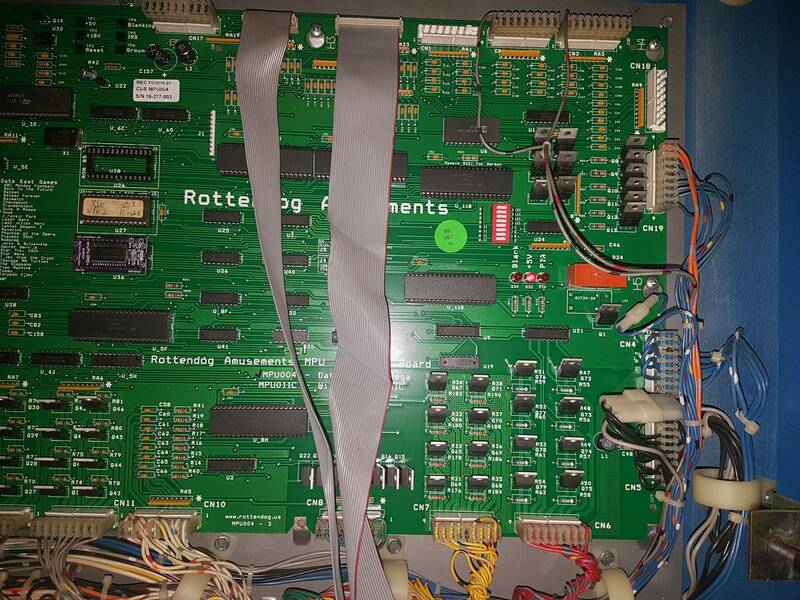 I'll try swapping the original RAM to the Rottendog board - looks like the picture RD has on their site is an older version of the board (it also doesn't have the dip switch pictured). If that doesn't work, I'll put the RAM back on the DE board, as well as the D3 and C5 and swap the old DE MPU back in...see if that does anything. Will post an update either way - thanks so much guys! This RD board ships with a different type of NVRAM from several years ago. 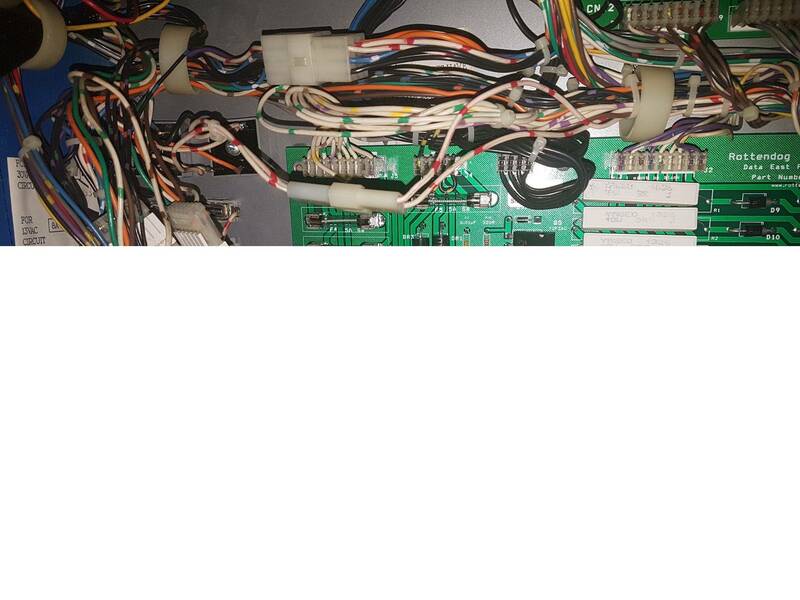 The pins on CN1 appear fine to my eye, but the wiring connector seems a bit coloured (like a dirty-white, not burned, but not sharp either...in fact, most of the connectors seem to be this shade of "dirty-white"). I swapped the original RAM to the RD board - no change. 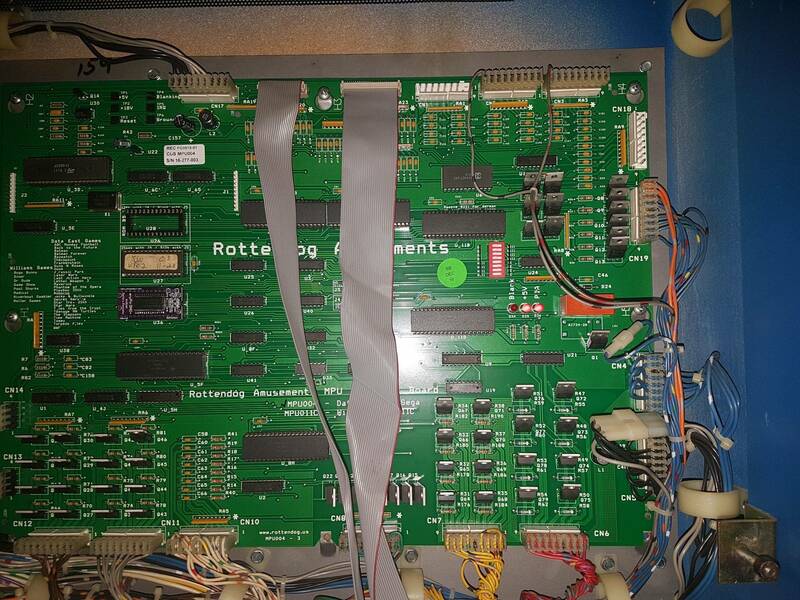 I then put the RAM, D3 and C5 back in the original DE board and swapped it for the RD board - no change. Both tries had the same start up ("May the Force be with you", GI illuminates while PIA and +5V on the MPU light, PIA turns off, BLANK turns on, GI turns off). Only change seems to be that when I shut the main power off, the GI briefly lights up again before going dark. The DMD doesn't display anything. I've also changed the DMD board back to the original DE board. sell it to me cheap? The game start? Is the dmd blank too? When the GI goes out, the BLANK and +5V LEDs remain lit, but the game doesn't start, and the DMD is blank. I've given the table about 2-3 minutes in this state, just in case, but nothing happens. ok BLANK and +5V LEDS remaining lit is correct after booting. So your cpu is booting, good. So it appears some voltages are out (12v for the display and others). Check connectors on the power board, making sure nothing is toasted. I know you said you checked fuses, but did you check all of the fuses, like the inline fuse next to the BIG BLUE capacitor? You'll have to start measuring voltages. Here is a guide that Clay created years ago. Its not easy stuff unfortunately but you have to start somewhere. this is part one. there are 3 parts to the repair document and lots of great troubleshooting. 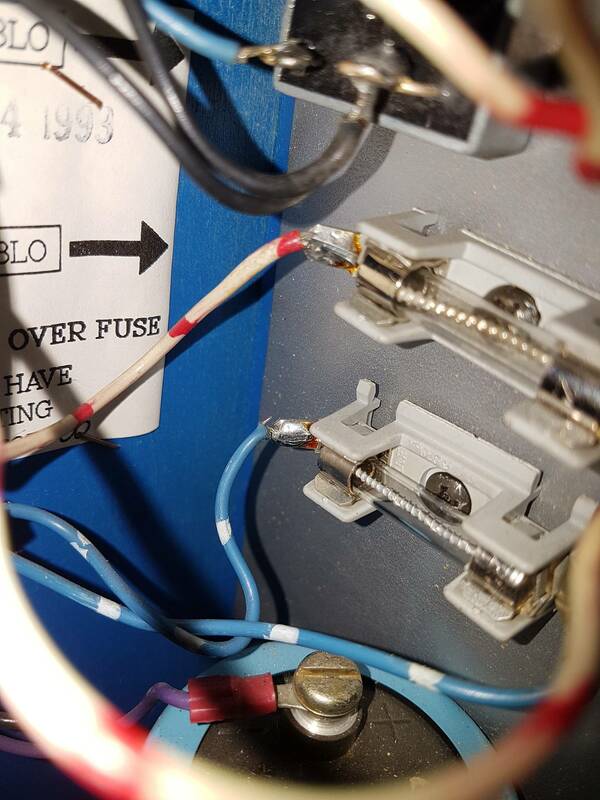 but did you check all of the fuses, like the inline fuse next to the BIG BLUE capacitor? 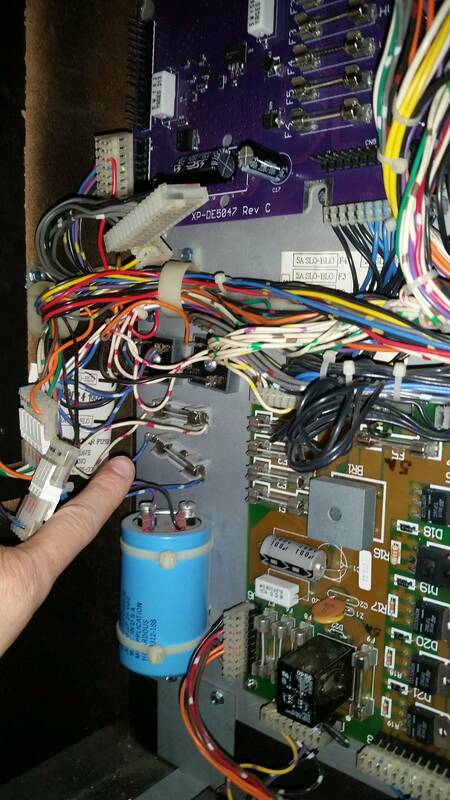 Okay, so the fuses themselves by the capacitor are okay, but the wiring looks...not great? 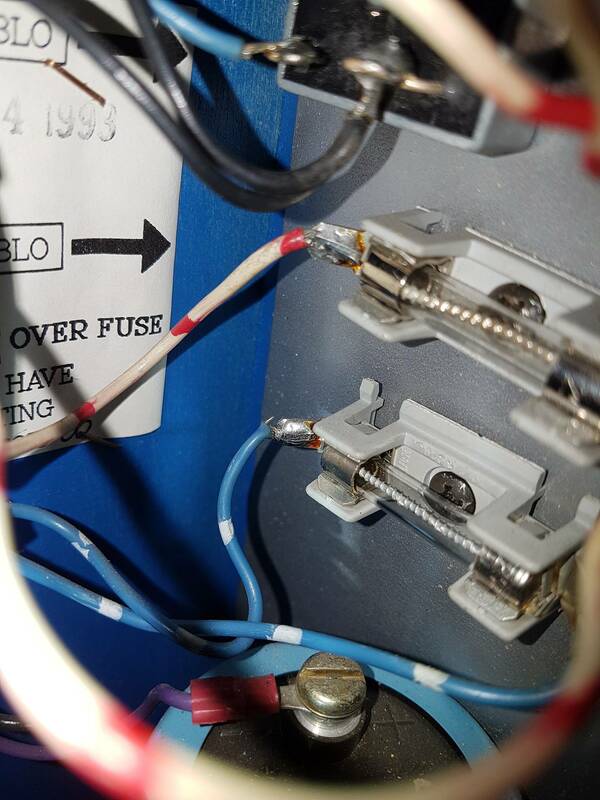 Again, I'm no genius, but it looks like the wire has pulled away from the fuse holder (hopefully my picture helps). I'm guessing I should replace the fuse holders and resolder the wires. Well, at least I'm learning along the bumpy road! Also, I had seen a rectifier replacement on Marco's Specialties - is it worth replacing the old giant capacitor at this point, or if it ain't broke, don't fix it? Can't tell on the right side as it's cut off, but the left side is normal in those pics. The fuse holders have "wings" that the wires solder on to. On the new Rottendog power supply board, are the +5, +12, -12 test points all reading the correct voltages? Do the three test points (+5, +12, -12 ) on the rottendog power board read those voltages (+/- 10%)? You want to measure voltage with the machine on. Listen to the dumbass. Really. 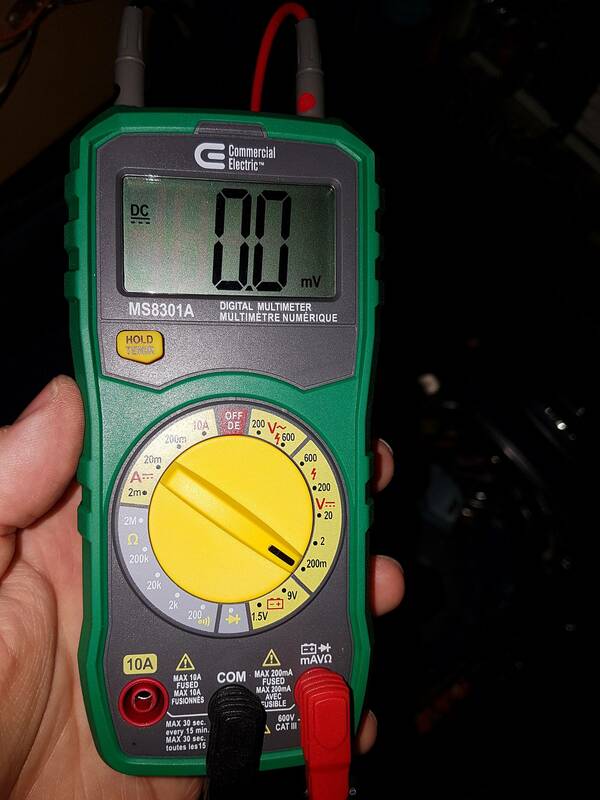 An auto-ranging multimeter is very nice to have so you don't have to set the range of what you're trying to check. Frys.com has the FLUKE 174 on sale for less than $100 pretty often. Put that on your wishlist.